Luther on turning the Scriptures into a lawbook. | The Old Adam Lives! Luther on turning the Scriptures into a lawbook. Thanks to CrossAlone Lutheran District for making this available on their site. And thanks also to flickr and armas_de, for the photo. I don’t know why, but the above link doesn’t function properly with me. After four attempts always only a black monitor!? As for Luther’s quote – that’s absolutely right. I’ve just visited another Gospel site and – oh, it was dispiriting. Over there a pastor urged his congregation to be obedient to some Scriptures (a certain letter of Paul). The explanation he gave for this was “because it is written” (paraphrasing). Sorry for the late reply. I just got home from a very long day. I tried the link and it worked for me. Hmmm. I’m not sure of the problem. If I can think of another way to post it, I will. I’m awfully tired and my brain isn’t working too well right at the moment. And you are right. It is sad when preachers use the law to try and make people better. That doesn’t work. it can only make them worse. Then go to Proper use of Scripture and click on Bayer; How the Bible becomes Holy Scripture (or something close to that). Hoping that you soon feel well again, but not so that you can respond faster, but because He will give you rest. Glad the other link worked for you. Another day today, like yesterday. Thanks for your wonderful insights, Susanne. 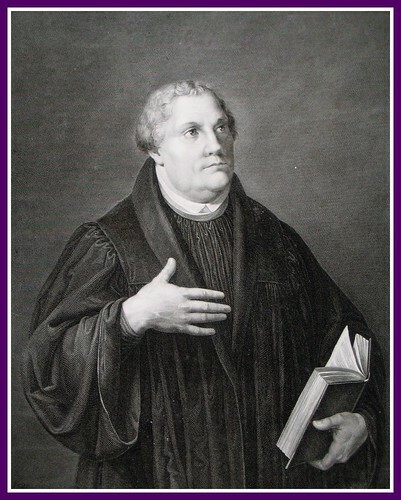 When I read the Luther Quote you posted, I immediately thought of a brief article written by Martin Luther (taken from Luther’s writings) that was printed in Modern Reformation Magazine a while back. The article is entitled “A brief instruction of what to look for in the Gospels.” Luther’s whole point in the article is that when we see Christ acting, speaking, thinking, or doing anything in the Gospels (Matthew, Mark, Luke, John), we are to see Him earning our salvation for us in those very acts. Luther is very strongly dissuading his readers from looking for “Christ as my example” as the chief focus in the Gospels, for in so doing the reader will lose the Good News, and read only Law. Sorry for the delayed respose. Moving a friend the last couple of days and have been away from the computer. I can’t wait to read the article (link you have provided). So much of the church today (and always) wants us to have some role to play in all of this. Even if it’s just a little bit. The little bit is the drop of poison in the pure clean glass of water. We can’t allow a drop of that stuff in the pure gospel. Those of us who know the complete freedom that Christ has so dearly won for us…will not.